LOS ANGELES, CA -- Two of America’s most effective advocates for better healthcare, patient rights and social justice, RoseAnn DeMoro and Tammy Smick, have joined the board of directors of Consumer Watchdog. DeMoro, who just retired after 32 years with the California Nurses Association, was named to Consumer Watchdog’s Consumer Advocate Hall of Fame at the nonpartisan, nonprofit group’s annual Rage for Justice Awards in June. She grew the nurses association into the most uncompromising voice for patients in America. Smick and her husband Tim were named to the Consumer Advocate Hall of Fame at the 2015 Rage for Justice Awards. The Smicks were thrust into the fight for patient safety after the tragic and needless death of their 20-year-old son, Alex, due to a doctor’s negligence and reckless prescribing. They have led successful battles to overhaul medical safety in the state. As executive director of the California Nurses Association, DeMoro pioneered enactment of the nation’s first safe RN-to-patient ratio law in California. Under her leadership the National Nurses United (NNU) formed in 2009 as the first national union of, by and for the nation’s registered nurses. It now represents over 150,000 members. 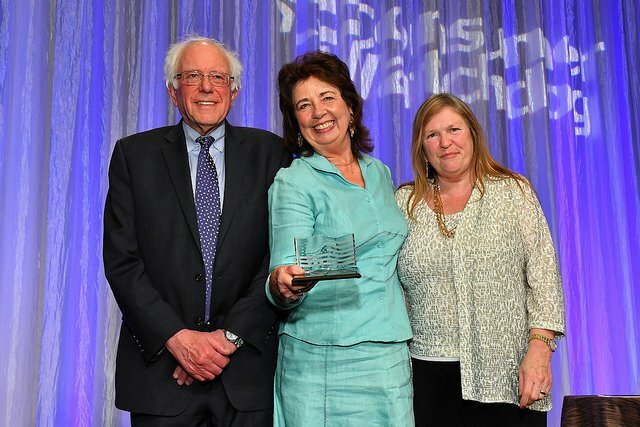 DeMoro served as NNU’s executive director and bought RNs across the nation together to lead the campaign to extend and improve Medicare to cover all patients and create a system of guaranteed health care. DeMoro lives in Napa County and has been evacuated twice due to recent wildfires, watching neighbors lose their homes. She said she has been inspired lately by Consumer Watchdog’s efforts protecting wildfire victims’ rights from the recent legislative assault by PG&E. When the Smicks sought to hold the doctors who killed their son accountable, they learned about a California law that has capped non-economic damages in malpractice cases at $250,000 since 1975. That law, the Medical Injury Compensation Reform Act (MICRA), closes the courtroom doors to families who lose a child, seniors, minorities, women and low-income victims of medical negligence. “I am honored and humbled to have been elected to the Consumer Watchdog Board of Directors, and in memory of my beloved son, Alex, I look forward to continuing fighting for patient rights and physician accountability alongside these amazing champions for justice,” said Tammy Smick. Tammy and her husband have campaigned alongside Consumer Watchdog to restore patients’ rights by indexing the cap on malpractice damages for four decades of inflation. Tammy was a citizen leader of the successful effort in 2016 to require doctors to check the state’s prescription database to ensure the safe prescribing of opioids. Her advocacy has helped expose the culture of secrecy around physician misconduct and the failures of the Medical Board of California to investigate and discipline doctors who harm their patients. The Smicks’ son Alex began taking prescription pain medications after a serious back injury. He sought help for dependency on the powerful opioid drugs he had been prescribed and checked into a hospital to detox safely. On his very first night in the hospital Alex was placed back on a new regimen of medications. The next morning, he was found dead. The Smicks spent months trying to unearth what had caused their son’s needless death. Ultimately, they learned Alex had died of the poisonous mix of prescription drugs administered in the very hospital he entered to get well. Tammy is a special education teacher for the Downey Unified School District.